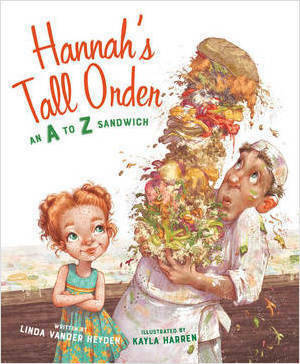 Storytime with Linda Vander Heyden, author of "Hannah's Tall Order"
Hannah is feeling just a bit peckish and knows exactly what she want to eat: an A to Z sandwich on thick whole wheat break! An what does an A to Z sandwich consist of? How about Avocados, Bean spouts, Carrots galore! and then Dill pickles, Egg salad, and of course the Figs that Hannah adores. But will Mr. McDougal have all the ingredients he needs to complete Hannah's tall order? This playful text is written in bouncing rhyme and takes readers through the alphabet, with illustrations that will entertain children and adults alike! Author Linda Vander Heyden is the author of Mr. McGinty's Monarchs and A Horse Named Jack. She understands Hannah's obsession with the perfect sandwich -- she remembers racing home from high school to lunch hour to make grilled cheese sandwiches before rushing back to class. She lives in Wisconsin with her husband, two dogs, two cats, and two horses!